On any trip with WE ARE, there is always an unexpected guest, one whose name may not appear on the list yet makes her presence boldly known from day one. She brings with her a bag of unknowns; she's familiar to most and goes by many names, but for now, we'll call her "Fate." La Saladita "Treading Lightly" Adventure with Anna Ehrgott was no exception; this gathering was written into the stars. From the conception of our group's dynamic, it was revealed we were a string of affectionate strangers, woven together by mutual friends, local surf breaks or colleagues, our threads of synchronicity growing longer each day. Our shared passions and life stories seemed to intertwine into a beautiful quilt of shared experience. We were off to a start that felt familiar and cozy yet mysterious all in one. Our fully curated "plant-based" adventure was underway, with a vegetarian menu planned and a volunteer trip to an organic farm all lined up for our superconscious, California based clientele, reflecting our sustainability efforts and ethos. Pinterest wouldn't be able to handle the influx of delicate dishes of dainty Mexican cuisine or gaggle of green-thumbed girls that was to emerge from this week-long escape. Little did we know Fate had other plans, as we were destined to meet Flora, a beautiful, Mexican Mamacita and the mastermind behind our meals, whose main objective was to stuff us silly with homemade feasts of epic proportions. After greeting us with a mile-wide smile, apron adorned proudly, she immediately proceeded to initiate a fish fry in celebration of our arrival. How do you tell this adorable woman that her culinary customs are getting in the way of our aggrandized plans to save the planet? One answer: you don't. The group was in silent agreement to eat what felt right, but the only feedback this woman deserved was giant hugs and kisses after presenting plates of homemade tortillas (with made-from-scratch corn flour, prepared on the chiminea in the backyard! ), chilles rellenos, arroz y frijoles, guacamole, fresh juice and more. Every day was a celebration of the senses with Flora and her daughters in the kitchen, and we instantly realized that more important than holding our ideals was honoring culture and expressing gratitude for her sharing of customs with our little family of foreigners. Saladita is a magical point break tucked into a sweet, tiny little pueblo outside of Zihuatanejo. The small town vibes were amazing, but we did not kid ourselves - we knew there was a chance we might not be the most popular group in the lineup, rolling in deep with a group of girls who were all capable and frothing for waves. Consciousness was key, splitting our group up into a dawn patrol van and sleep-in crew who walked and picked up trash on their way to the point. Anna gave a surf workshop emphasizing the rewards of being patient, and offered pointers about being overly conscious and gracious to locals, rules of priority, and overall etiquette so that we could go above and beyond the rules of respect. Whether Fate felt our consideration or we just got lucky, every day provided perfect left-handers, leaving us giggling, salty and sunburnt as we piled into the van, awaiting Flora's feasts. And then fell the farm. Miscommunications led to misunderstandings about dates and intentions and our organic farm was suddenly unavailable. On our adventures, when our plan goes awry, we do what we know best: we lean in. We lean into Fate, whisper in her ear, and await her reply. In Saladita, her answer came in the form of Kevin. There's no way to describe Kevin other than just an overall GOOD human. We met Kevin in the surf although a little bird may have told him we were hungry for a community service project to sink our teeth into. Born and raised in California, both Kevin's parents are from La Saladita and immigrated to the U.S. before he was born. He traveled all over the country in his R.V., cutting hair, working on farms, meeting interesting folks and spreading good vibes before cruising back down to Saladita to see what his homeland was all about. He's been coming back every winter for a few years now, and his pride for the land shines like a bright light. He was gifted an old abandoned building near el tope in Los Llenos that was passed down from his cousin. His goal is to use this building as a community center, where he can remind his local family of their heritage in growing food, making art, and designing systems around self sustainability. Only two generations ago (Kevin's Grandparents era), La Saladita was totally self sustained with local agriculture, no plastics, and the use of horse and buggy for the 40km journey to Zihautanejo. When we met, he told us his plans for the building and our eyes lit up. We immediately set up a time to chat about the see how we could help. He told us he'd been waiting, waiting for the right group and the right time to launch this dream project and when he met our group of sixteen sets of eager hands, he knew the time had come. Kevin described to us his space and the transformation he envisioned, about his desire to host ceramics workshops, gardening tutorials, and gatherings with live music and dance, how he wanted to remind the locals of their power in growing food and coming together as a community to overpower violence as well as give children a sanctuary for art, music, and play. Among our participants we had Kristen Morrison, regenerative fashion designer, natural dyer, and co-founder of the Ecology Center in San Juan Capistrano, Leia Marasovich, activist, photographer and yogi with a background in sustainability and garden design, and a slew of other girls with experience working in gardens, small and large. We each were able to give him unique feedback on his ideas, plus draw up illustrations and project planning concepts to turn his visions into a reality. Fired up with creativity, we invited Kevin to our week's activities. We indigo dyed Anna's beautiful Sage Brush Bags for a quiver of watery blue board socks, took a cooking class from Flora where she showed us proper technique for tortilla prep, trekked the beaches by horseback and visited a local hot spring while the stars were glistening in the black night sky. On the last day of the trip, we invited all the kids from the community to the new space where we kicked off the makeover of this abandoned building turned community center. The team helped Kevin and his Dad plant native plants all around the center. 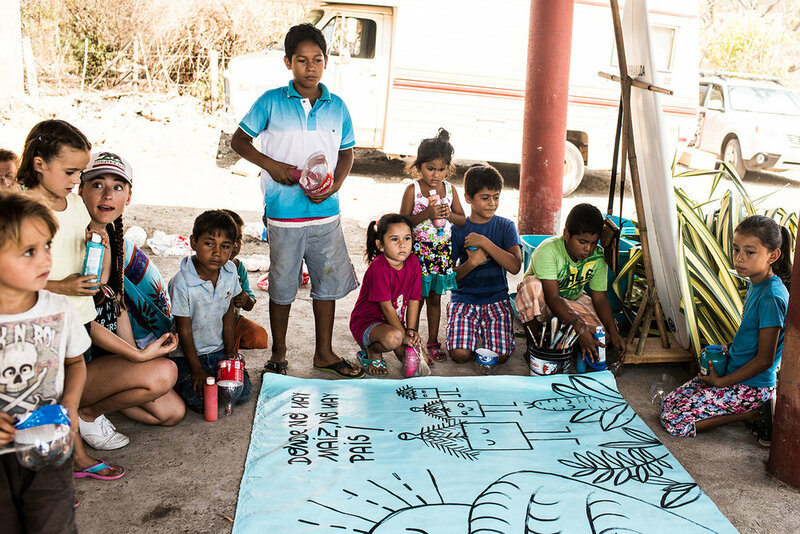 We cut recycled plastic bottles and strung them into a hanging herb garden with the community kids, and got them painting with a mural project featuring the traditional Mexican saying "si no hay maiz, no hay pais," "if there is no corn, there is no country." Snacks were devoured, coconuts guzzled, laughs shared and smiles covering everyone's faces. After only four hours the space looked so much brighter, greener, and more inviting. 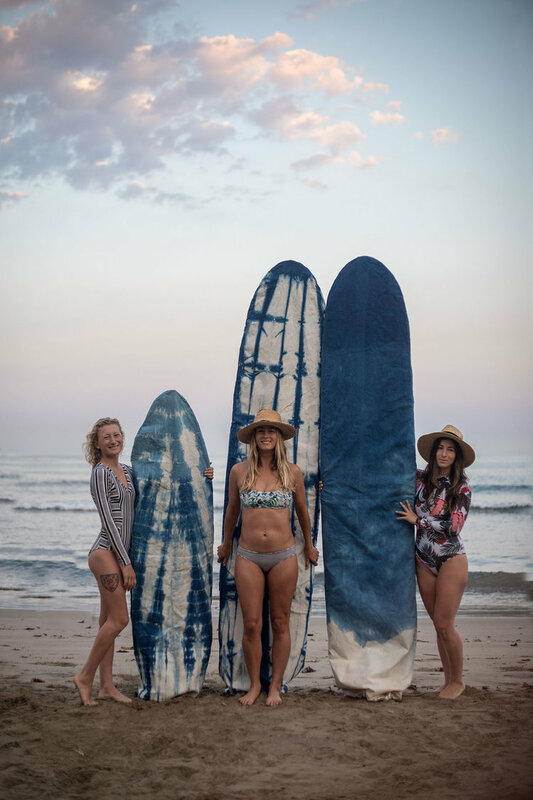 We celebrated with a sunset surf to say goodbye to this beautiful land that offered us so much culture, sweetness, and joy through not only its landscape but its inhabitants as well. It's impossible to describe the most intimate details of an adventure as powerful as ours to La Saladita. Almost as impossible as it is to imagine the incredible unfolding of what happens when your plans fall through. All we can say is that Fate is confusing, chaotic, and often super inconvenient, but she never lets us down, and will be a VIP on the guest list of any future WE ARE adventure.